The weather forecast calls for snow today, which doesn’t make me happy. So let’s head to warm and sunny Australia and forget about the white fluffy stuff. 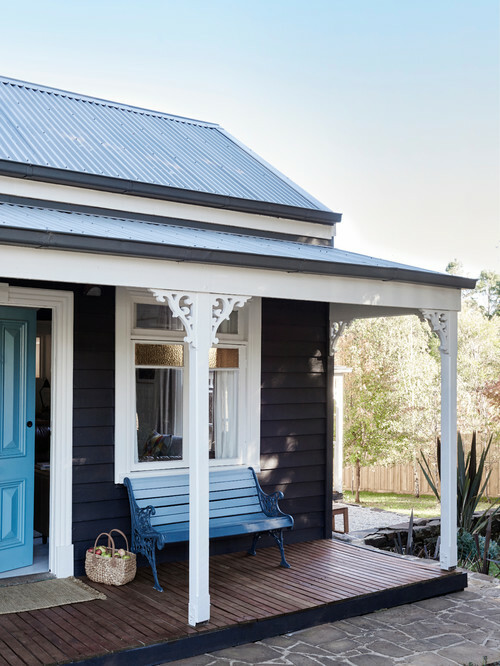 I think you’ll enjoy today’s minimalist style blue cottage! Inside you’ll find simple furnishings and a painted floor. I like the clean lines throughout the home. 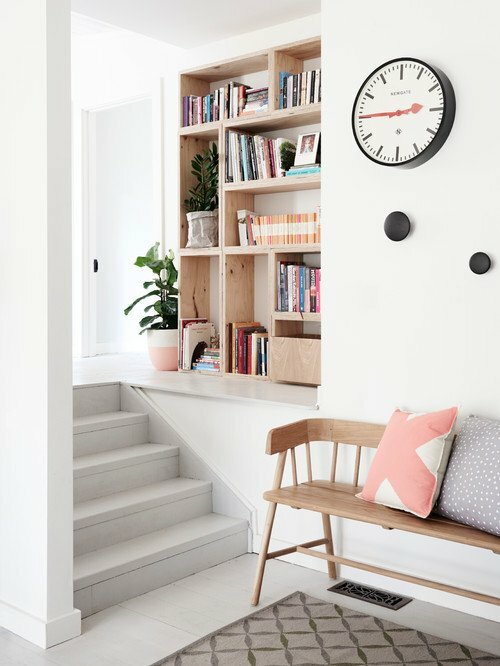 The foyer welcomes you with a quaint wooden bench, a built-in bookshelf, and a short set of steps. 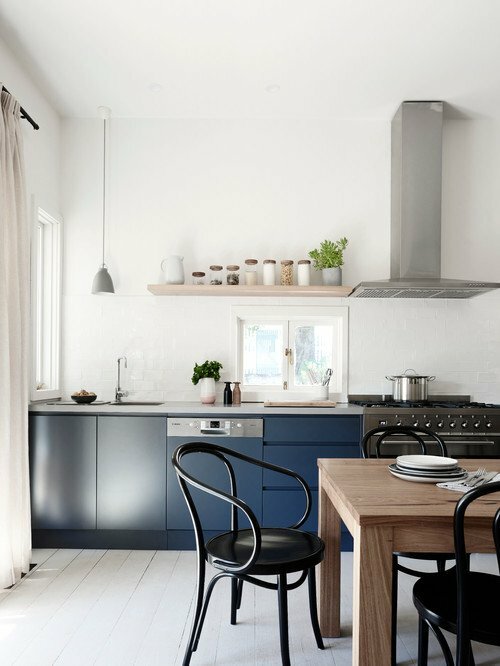 Deep blue cabinets and black chairs lend an air of modern appeal in the minimalist style home that’s filled with Australian sunlight. Another view of the eat-in kitchen shows the expansive glass doorway with views of the garden outside. 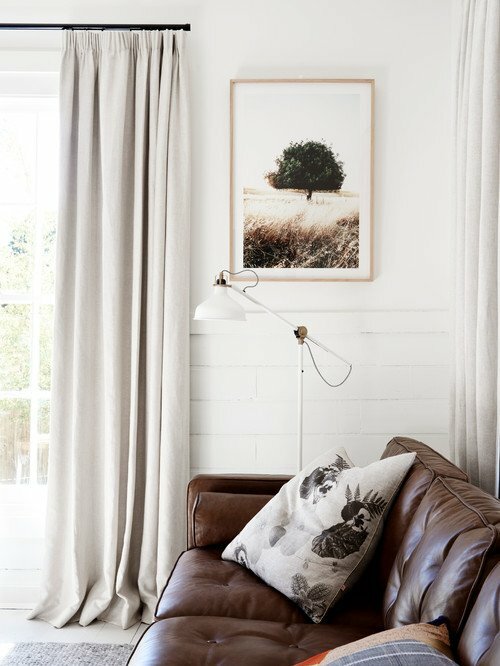 Neutral furnishings adorn the minimalist style living room, complete with a comfy leather couch. 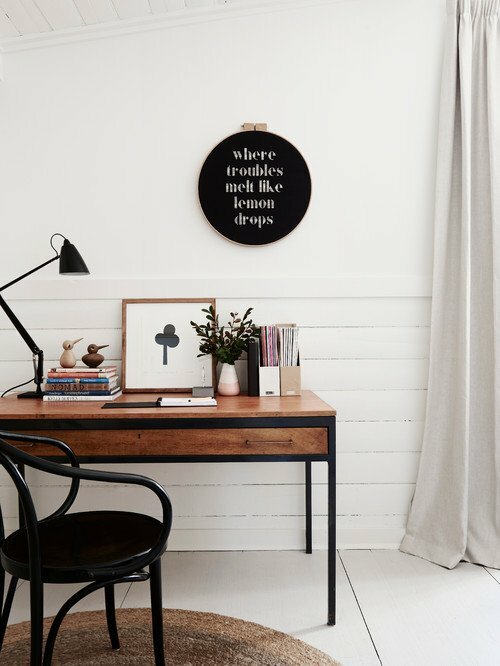 What a cute sign in the home office – “where troubles melt like lemon drops.” Hopefully the snow outside will quickly melt like lemon drops! 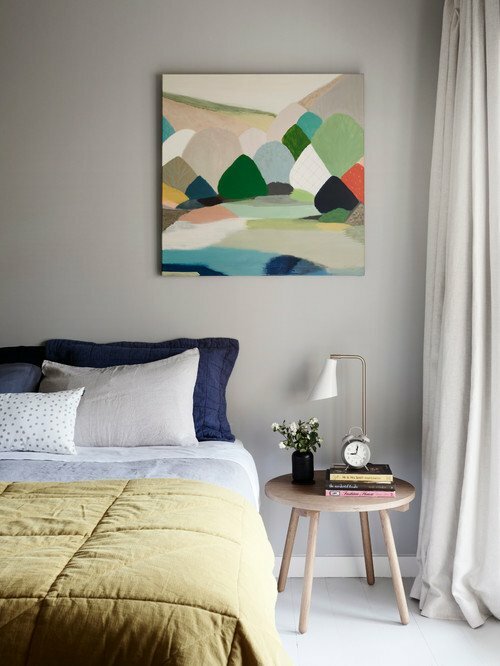 An abstract painting adds a shot of color in one of the bedrooms. I think it’s an abstract landscape scene. At least, that’s what I see. 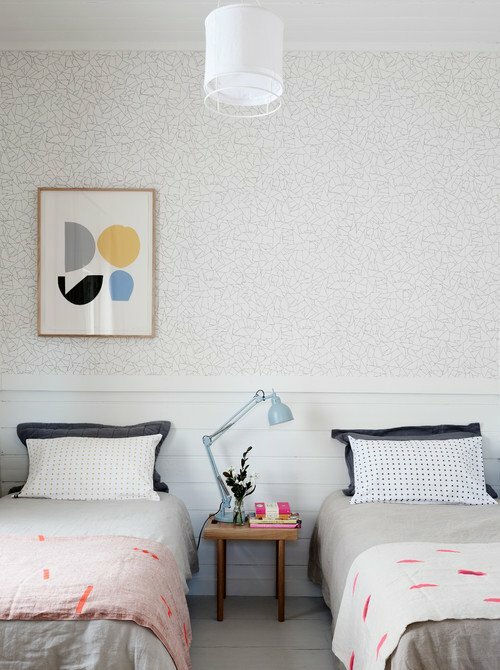 Another abstract piece of wall art adorns another bedroom with its sweet twin beds. 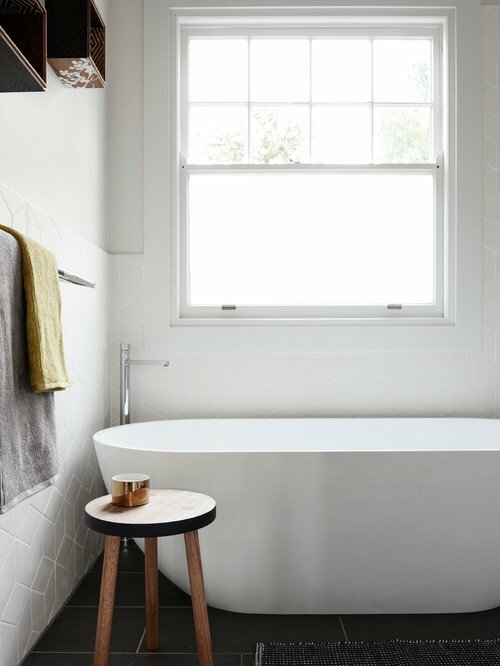 A serene bathroom awaits for a restful soak in the tub after a day in the garden. 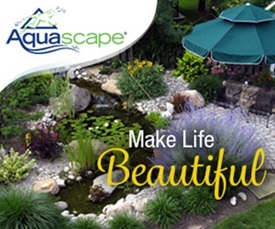 I can’t wait to get out in my garden and enjoy dirt under my fingernails. Maybe next weekend! 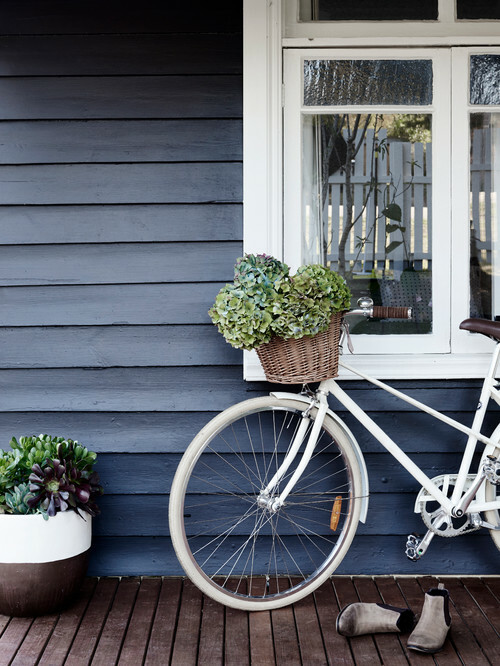 A beach cruiser bike rests on the front porch of the blue cottage with a basketful of beautiful hydrangeas. Such a sweet scene. 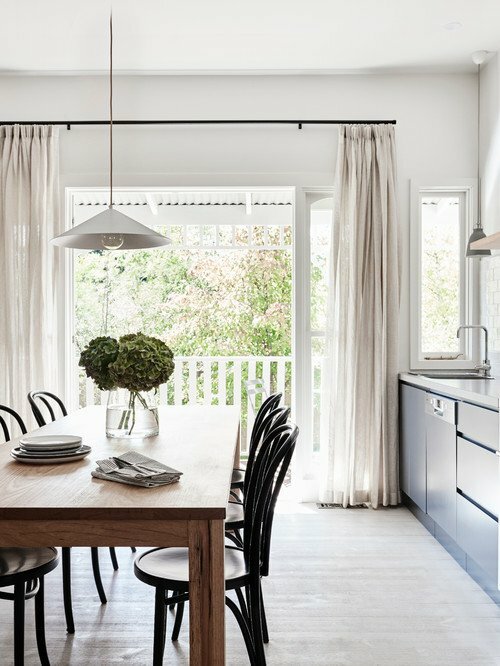 See more photos of today’s charming minimalist style blue cottage by One Girl Interiors over at Houzz. 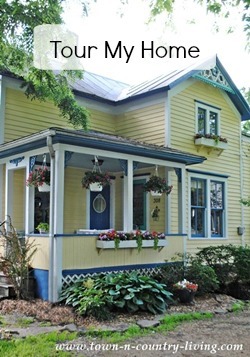 More Cottage Tours for You! 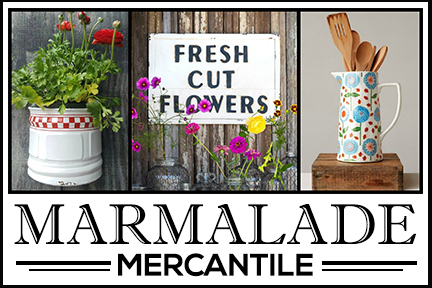 I love this simple little cottage — and this is my idea of an actual “cottage,” rather than pictures and tours of some calling themselves cottages that are huge in square feet and in design. 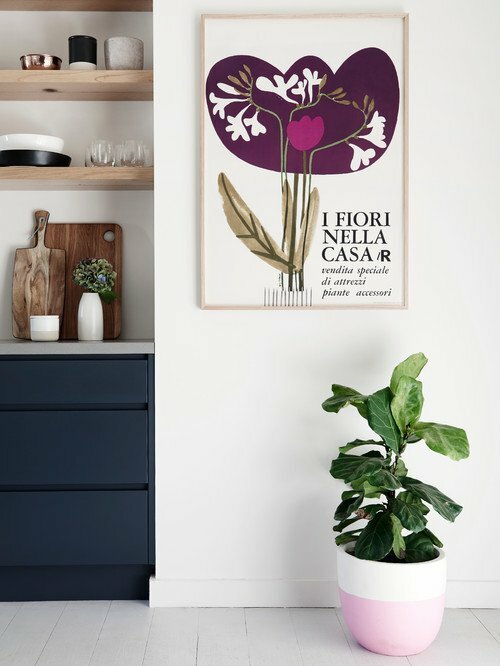 The simple color scheme of light gray, dark blue and wood tones is perfect. Thanks for sharing. I like this plain and simple home with love and care it is a castle.Loved the eat-in kitchen and that livingroom. Thanks for sharing. Every thing looks neat and tidy. I would like to see more of the kitchen. 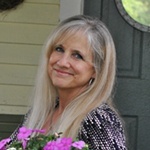 Nice for a while but, I would want some of my STUFF scattered around……you know…..just to know your home.